To hear John’s story read by Adam Jacabs of Perth Academy; please press play on the audio file. Private John Henry Cairns 4427, 6th Battalion The Black Watch. John Henry Cairn was born on 8th May 1893 to James and Agnes Cairns. He was the eldest of two boys. John’s parents were married in Scone in 1892 and continued to live in the village. Both parents died from tuberculosis when their boys were young and the brothers went to live with an aunt and uncle in Dumfries. After finishing education, John worked for his uncle as a Boot Maker. 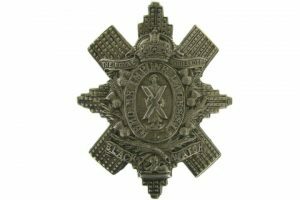 On the outbreak of WW1 he enlisted with the Black Watch. He was stationed initially in St. Andrews, Scotland, before being sent to France. Private John Henry Cairns was posted missing on 25th September 1915, the first day of the Battle of Loos. He was 22 years old. He is remembered on the Loos Memorial, Panel 78/83. John was entitled to the 1914-15 Star, Victory and British War medals.